- SERRATED KNIFE - cuts quick and clean wine bottle's protective foil. - TEFLON COATED SCREW - for frictionless and easy insertion, works with natural and synthetic corks alike. - DOUBLE-HINGED LEVER - delivers effortless cork extraction. - BOTTLE OPENER - opens any metallic cap bottles. Embellish your home, capture your guests' attention and put a smile on your face every time you open a bottle. Surround yourself with beauty. 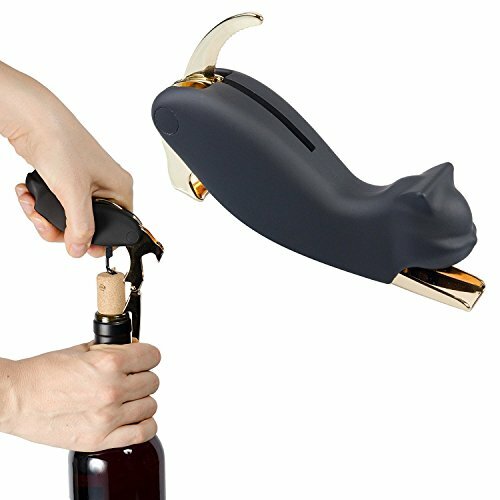 Replace a colorless, shapeless and impersonal corkscrew with a unique, award-winning, piece of artwork. Ergonomic, warm to the touch and safe-grip soft body handle. Frictionless Teflon-coated screw and Double-hinged lever action for easy and effortless cork extraction. Share the love, reward family and friends with this timeless gift presented in its exclusive and elegant packaging. If you have any questions about this product by Plaisir de la Cave, contact us by completing and submitting the form below. If you are looking for a specif part number, please include it with your message.